You only need 3 household ingredients to make your own Homemade Wood Floor Polish. This solution is a safe and effective way to clean and restore shine to dull and aging wood floors. This post contains affiliate links, which means if you purchase anything using one of these links, I will receive a small commission. Cleaning wood floors must be done with a little extra care than cleaning tile and linoleum. Cleaners with harsh chemicals can strip wood floors, leaving them dry and brittle. Cleaning wood floors with water can be done, but you must take great care in making sure that no water is left behind on your floors, or they could warp. The same can be said for wood laminate floors as well. Harsh chemical cleaners can cause laminate to discolor and can even wear away the top layer of the laminate. Water can cause warping and buckling in laminate floors too. 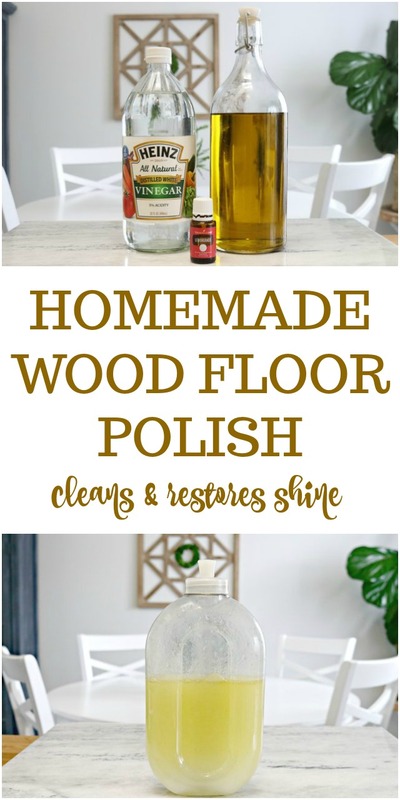 You can easily and inexpensively make your own wood floor cleaner/polish using a few items from your kitchen pantry, and get those floors looking like new again! 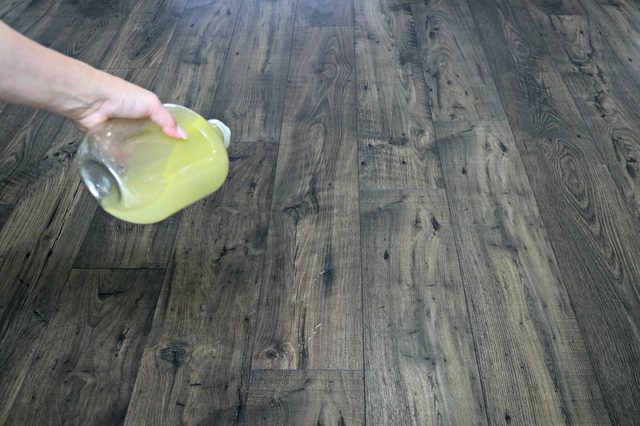 If you’d like to see how I make and use my homemade wood floor cleaner, I created a quick video showing just how easy it is! What’s in Homemade Wood Floor Polish? How Do You Make Your Own Wood Floor Cleaner? 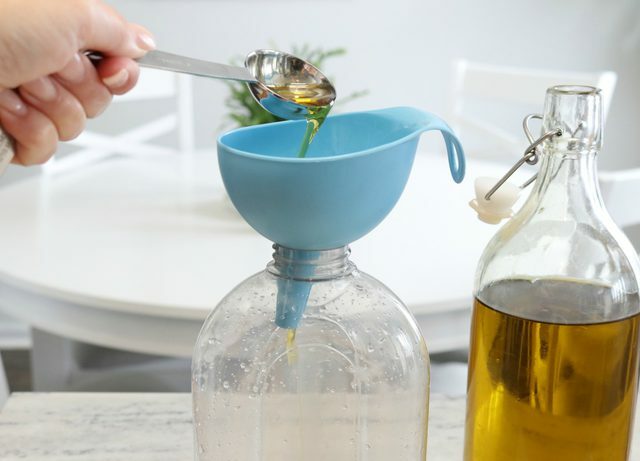 Step 1 – Add 2 tablespoons of olive oil to a clean squirt bottle. I used an old floor cleaner bottle that I washed thoroughly. 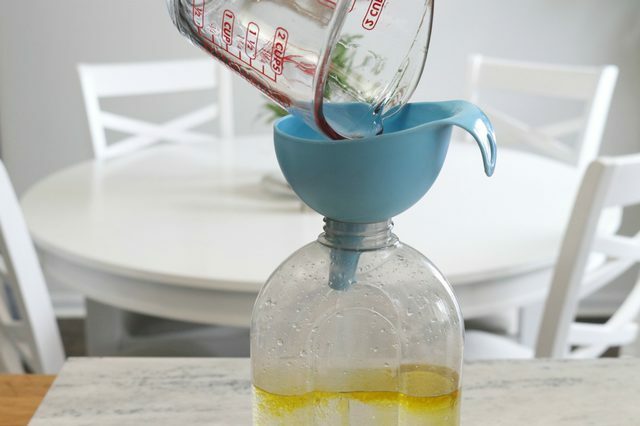 Step 2 – Add 1 tablespoon of distilled white vinegar. Step 3 – Add 15 drops of lemongrass essential oil. This step is completely optional. I like to add the lemongrass oil for fragrance. You could alternatively use lemon or orange essential oil or completely skip this step. Step 4 – Finish it off by adding 2 cups of warm water. Step 5 – Shake well before each use. Because there are no harsh chemical binders in this floor cleaner/polish, the ingredients will separate between uses. Just give it a good shake before each use and it will work perfectly. 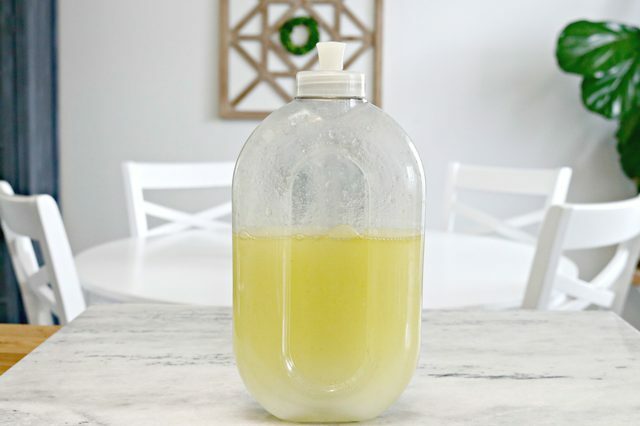 Start by making this amazing homemade floor polish / cleaner. 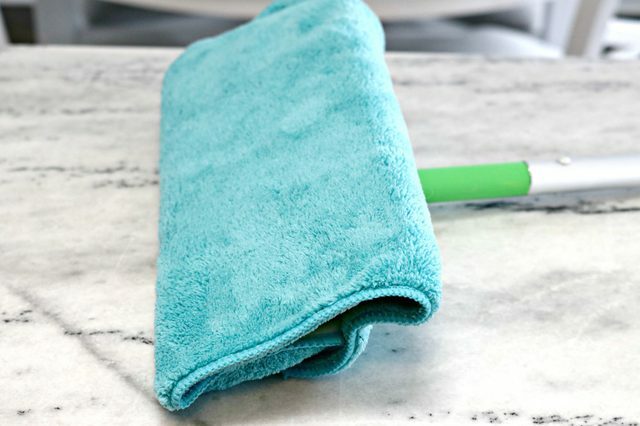 Attach a microfiber cloth to mop head. I like to use one of my old Swiffer mops. I simply tuck the microfiber cloth into the indentions that are typically used for the Swiffer dusters. You could also attach the microfiber cloth with an elastic band on each side. You can purchase Microfiber Cloths HERE if you like. 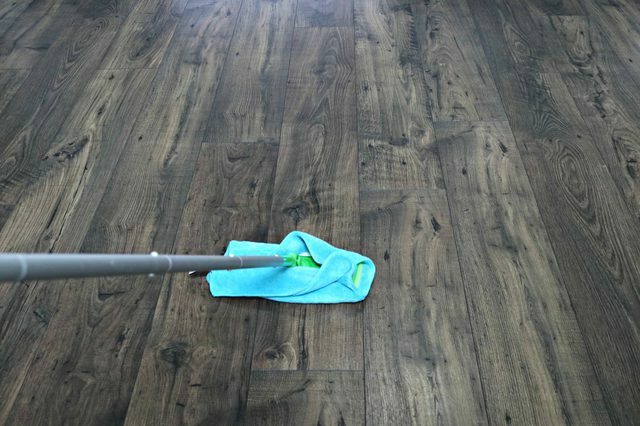 They are amazing for cleaning so many things in your home and won’t scratch wood or laminate flooring. Simply squirt or spray the polish on your floors in small sections. And use the microfiber cloth mop to work the polish into the floors. No need to rinse! 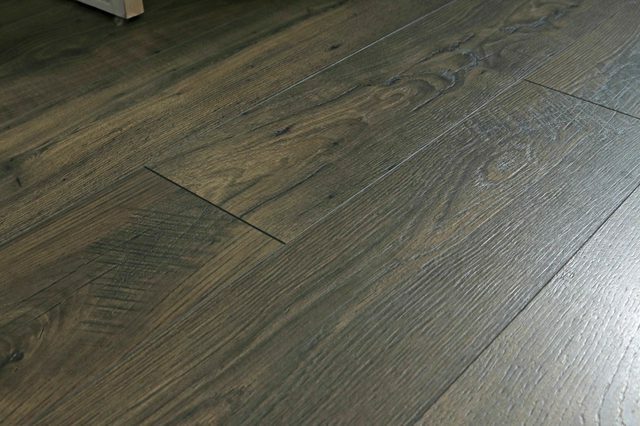 The vinegar and water help to clean the floors while the olive oil helps to polish and restore shine. Your floors will look amazing and smell great too! This polishing / cleaning solution is safe for wood and laminate floors. 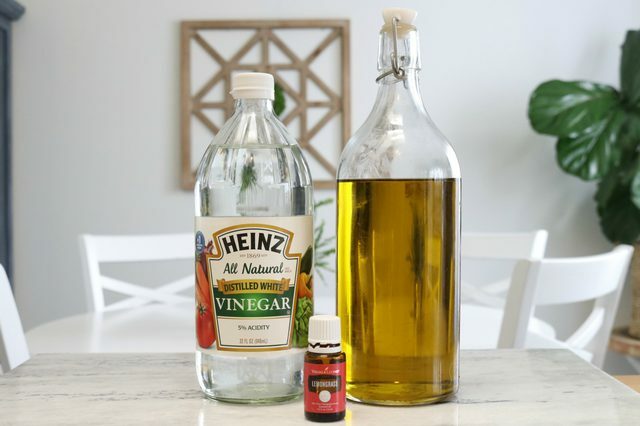 Be sure to pin this cleaning recipe to your favorite Pinterest board below, and check out all of my cleaning tips and tricks too! 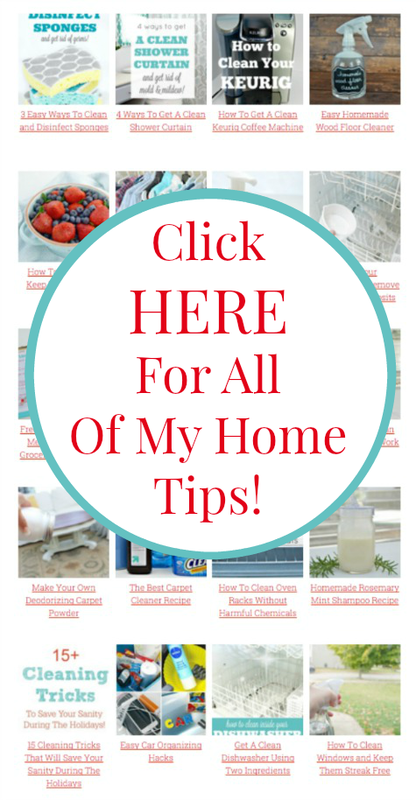 Find hundreds of easy Cleaning Hacks and Home Tips HERE on my Home Tips Page! Have tips that you’d like to share? Join my Facebook Community Page and share them there! 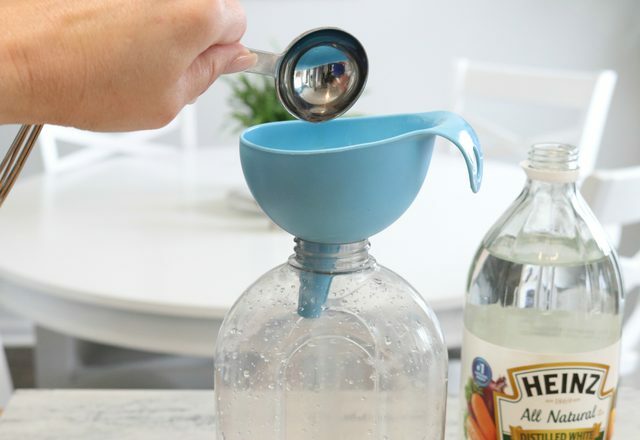 Be sure to sign up for our emails below so you don’t miss a single cleaning tip or recipe! I am using a natural/organic cleaning product because I have a baby crawling everywhere. That is why I’ll always try to avoid over the counter cleaning products. Thanks for sharing this article. I will try to do this. I have new, high gloss laminate floors and was wondering if the wooden cleaner also works for that shiny finish (unfortunately I think it was a bad decision to go for glossy….)? Or does the olive oil make it streaky? Thanks a lot for your feedback! Maybe you have a hint how to clean shiny laminate? Hi, Steffi! Thanks for the kind words. I’m not sure how it would work for the shiny floors. I do know that Bona works great for them though. It leaves no streaks and cleans really well. I have used it, and find that the all in one mop with sprayer that they sell is really great. Hope this helps! Thank you so much for the swift reply, dear Jessica. Very much appreciated and I will give the Bona a try as per your suggestion. Again – amazing blog and a big thank you! Hi. Does using olive oil on the floor attract mice or bugs? No, I’ve never had an issue with either. It leaves no residue behind, but I would wait for the floors to dry before having her walk on them. Hope this helps! Your floor cleaner is the best, no kidding. My kitchen and bathroom floors are linoleum and laminate everywhere else (I am a renter while our house is under construction, so no choice there) and were dull. Commercial products did nothing. They look new, shiny and are not slippery. Best tip ever. Thank you. I was wondering if it would be slippery. Thank you for that information!